It’s only been a few short months since dipping my toes into crypto full time, but man, does it feel longer. The handful of conferences I’ve been to have spanned the chasm of blockchain, from shillfests to hackathons galore. And sadly, each and every one has left me feel wanting; from dry lectures covering not-so-subtle infrastructure pitches to here’s-our-new-whiz-bang-library-that-utilizes-our-system workshops. I’ve walked away from each event drained from the pitches vying for my attention, technical conversations knee-deep in newly-learned jargon and non-stop transactional interactions with other attendees. I was starting to lose hope I’d ever find an event with any real substance — one where I’d walk away fulfilled. So I was pleasantly surprised to find something a little different in Prague last week at the annual Ethereum developer conference, Devcon. What I found was something I’d almost given up expecting to see in this space, some humanity. Quite frankly, I’ve never been to a venue quite like it, and instead of emerging bleary-eyed and run-down each day, I’d walk out invigorated. The first thing that struck me was the space itself. 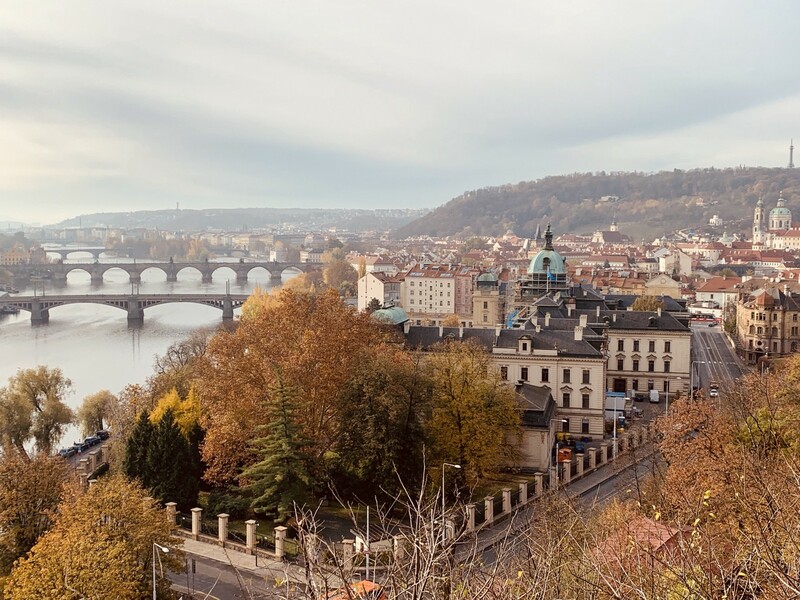 The Prague Congress Centre is a gorgeous venue with lush view over the city, and tons of natural light. Each day had a wide selection of local and healthy food choices, with reusable plates and utensils to reduce waste. Quite frankly, I’ve never been to a venue quite like it, and instead of emerging bleary-eyed and run-down each day, I’d walk out invigorated. The next thing I noticed was the tone of the interactions. It’s hard to find people in the blockchain space — including Ethereum — who aren’t constantly pitching themselves, their project and their ideas at you. 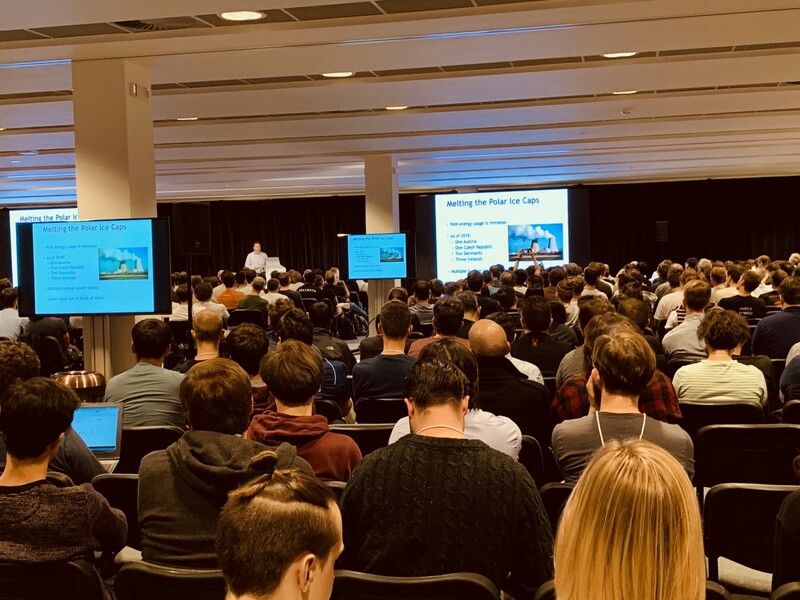 Yet I noted time and again, that the anxious, sometimes arrogant behavior so common in the industry was much less present at Devcon than at other conferences. Sure, conversations in the hallways were still very transactional, but the tone was more curious than questioning. Perhaps the MC Jonathan Mann and his endearing songs helped set the mood as we laughed along with each other about Ethereum’s woes (Vitalik’s refrain “that didn’t work” for the number of Ethereum 2.0 false starts really hit the mark). They challenged us all to stand up for the freedoms we espouse. Another contributing factor to the humanism I felt was the content. As expected, there were deep dives on a number of upcoming Ethereum v2 (ahem Serenity) technologies, yet there were also a number of talks touching on social responsibility. This included Lane Rettig’s presentation on Wednesday (Towards a Socially Scalable Etherean future), Cory Doctorow’s lecture on Thursday (Decentralize, Democratize or Die) and the fireside chat with Stewart Brand — hacker and author at age 79 — at closing on Friday. While the crypto froth of 2017 may have brought a large number of undesirables into blockchain, there is still a strong libertarian undercurrent that these speakers paid homage to. They challenged us all to stand up for the freedoms we espouse. I found their passion for humanity refreshing and inspiring. The agenda also focused heavily on user experience (UX). There was the implicit acknowledgement of the need for better usability in blockchain — something many of us agree is sorely lacking. UX after all is the intersection between human and machine, and the creation of that interface layer requires both strong technical skills as well as empathy. There were a number of designers in attendance, some of whom volunteered their time each day with UX insight on fledgling projects. They not only brought their diversity of experience, but also their refreshing perspectives. Speaking of refreshing, I also found the Artifaqts artworks to be a fun addition to the week — those computer terminals decked out as sacrificial alters from Dante’s Inferno — they added a welcome creative flair to the conference. Hats off as well to the Hellhound team, who hosted the very fun — and challenging — Escape the Room. We didn’t pass level 3, though I blame myself for that (not to mention those similar-looking shapes!). The effect was… stunning. I found myself sneaking off there a number of times to meditate and unwind. Finally, I have to mention the Neptune room. It was put together as a sensory reprieve from the intensity outside. I’m a sucker for acoustic instruments, world music and soundscapes, so needless to say Neptune was my heaven. The artist Laura Inserra performed on instruments from around the world into microphones arranged in an inner circle, with corresponding speakers placed in a circle outside. 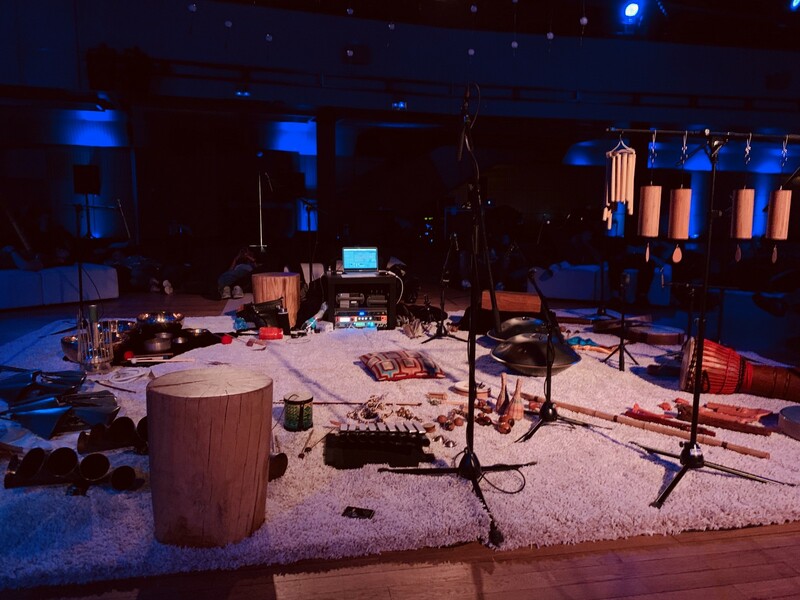 The audience was encouraged to bask in the space between, lounging on beanbags and ottomans, as she mixed acoustic sounds with prerecorded soundscapes underneath the flow of responsive LED lights. The effect was… stunning. I found myself sneaking off there a number of times to meditate and unwind. Kudos to whomever in the conference organizing committee pushed for it. I felt truly privileged to have experienced those performances each day. So all that said — how can the event improve? Another process the JSConf events practice is opening up the Call For Presenters (CFP) selection so anyone can see all the submitted talks that the chosen were taken from. This gives attendees a peek behind the curtain at what kind of content the community is submitting, and what the organizers have prioritized. There is also a tendency at JSConf events to include surveys after talks to ensure speakers’ receive feedback, hopefully improving their craft. 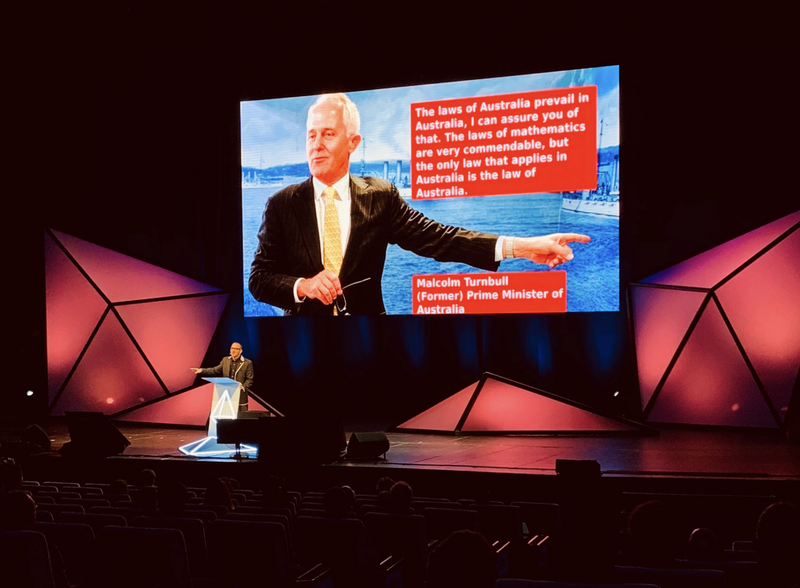 I would have dearly loved to see improvements there, as a number of speakers have a ways to go to make more approachable and engaging sessions. In terms of engagement — I think there was room for more interactivity. One of the more enjoyable sessions during the week was a workshop on Building Bounties Based Products to Change the Gig Economy. It was designed as an unconference — topics were suggested and voted on initially, then we were encouraged to split up into fresh pairs to discuss, before bringing ideas back to the whole group. What I appreciated the most about the session was how inclusive it was — everyone had thoughts and ideas on online reputation, ethics and quality assessment, and all disciplines were welcome — developers, designers and product managers (among others) were all able to add their thoughts and opinions. We are a rich community, and we can do so much more than just drink and talk. While that workshop was a good step, I feel there’s even more audience participation we can foster at events such as these. We are a rich community, and we can do so much more than just drink and talk. We all have knowledge and experience to bring to bear, so I’d love to see more discussions around topics such as personal freedoms, human connection, empathy to our fellow beings and social responsibility. Devcon IV really impressed me. It showed me that while the blockchain space is awash with wealth, ego and arrogance, there are some trying to do and be more. I commend the Ethereum Foundation for their efforts and hope to help do my part to give back to the community to help strengthen it. A huge thank you to the organizing committee of Devcon. I know from experience how much work goes on to organize a developer conference, and for 3000-odd people to walk away smiling, an army of people have to be thanked. Disclaimer: While I was at Devcon on behalf of Havven, these opinions are my own. 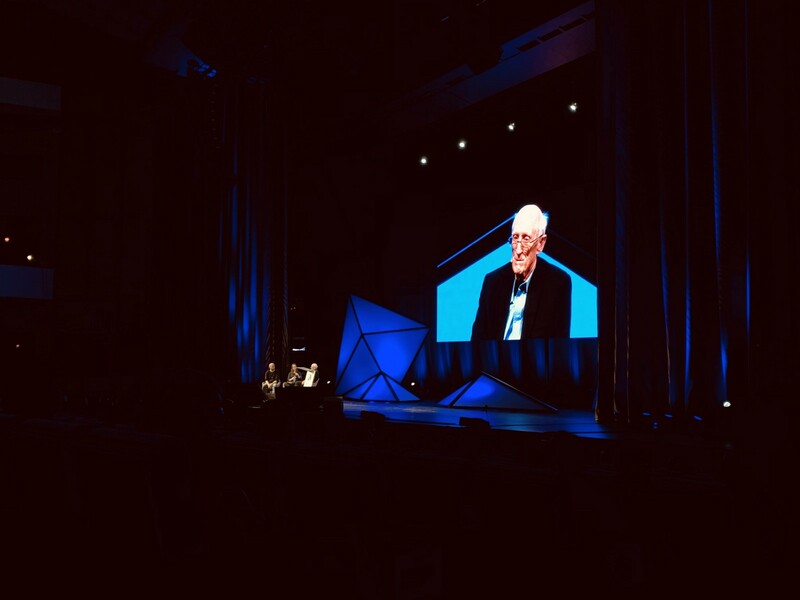 A conversation with Stewart Brand, hacker and author at 79.